Matthew Rognlie says that inequality may not grow in the way Piketty predicts, finding that the long-term rise in capital income is driven mostly by housing, not labor division. Capital income is not growing unboundedly at the expense of labor, and further accumulation of capital in fact most likely means a fall in capital’s share of total income – refuting one of the main theories of economist Thomas Piketty’s popular book Capital in the 21st Century. Existing studies that show an increase in capital’s share of income miss the growing role of depreciation in short-lived capital, in items such as software, says MIT’s Matthew Rognlie in “Deciphering the Fall and Rise in the Net Capital Share.” Rognlie subtracts depreciation in seven large developed economies (the United States, Japan, Germany, France, the UK, Italy, and Canada) to get net capital income, and finds that the only long-term rise in capital’s share of income is in housing. Capital income elsewhere in the economy has grown moderately, but it is only recovering from a large fall that lasted from 1948 through the 1970s. Piketty’s Capital argues that the role of capital in the economy, after falling during the Depression and two world wars, is set to recover to the high levels of the 19th and early 20th centuries. According to Piketty, wealth will accumulate amid slowing economic growth to push up the capital-to-GDP ratio in the economy, which will then cause an increase in capital’s share of income – and growing inequality. In contrast, Rognlie finds that a rising capital-to-GDP ratio is most likely to result in a fall in capital’s share of income, since the net rate of return on capital will fall by an even larger proportion than the capital-to-GDP ratio rises. Outside of housing, postwar changes in the value of the capital stock have not led to parallel changes in capital’s share of income. In fact, the value of the capital stock relative to private income reached its highs in the late 1970s and early 1980s, when capital’s share of income was near a low. Rognlie shows that the share of net income generated by housing has risen in all seven large developed economies since data became available. 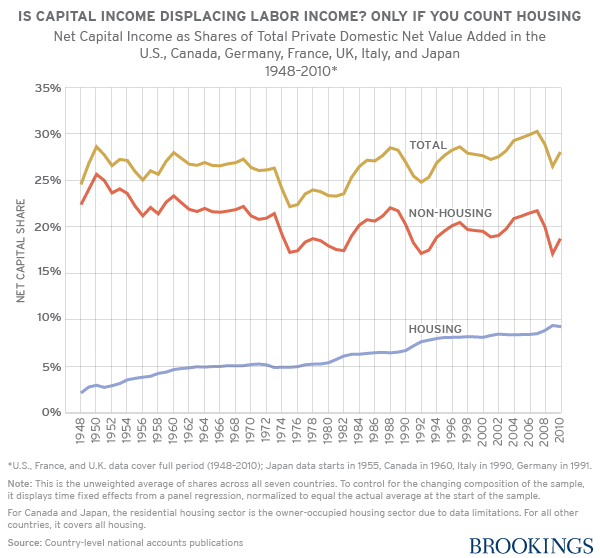 “Housing’s central role in the long-term behavior of the aggregate net capital share has… not been emphasized elsewhere…Observers concerned about the distribution of income should keep an eye on housing costs,” he writes. “Beyond housing, the results in this paper suggest that concern about inequality should be shifted away from the split between capital and labor, and toward other aspects of distribution, such as the within-labor distribution of income. Although the net capital share has at times seen dramatic shifts both up and down, away from housing its long-term movement has been quite small, and there is not strong reason to suspect that this pattern will change going forward,” Rognlie concludes.